A host of newcomers has entered the energy drinks market. But making an impact will not be easy. A carload of women in skimpy clothing landed up outside Saurabh Garg's college one day in 2005. He was among those they accosted offering a free can of the energy drink Red Bull. Garg couldn't resist and once he had tasted the beverage he became its diehard fan. Does it really increase energy levels? "I've not really felt energy running down my spine or anything like that whenever I've had it," he says. "But it has helped me stay awake even when I badly needed sleep." Garg, who once worked for an event management company, had to often put in very long hours and Red Bull helped him handle them well. But Garg's loyalty to Red Bull may soon be tested as a host of other energy drinks have entered the market in the last five years. The energy drinks market in India is still small - barely Rs 700 crore, or five per cent of the total soft drinks market, which is dominated by colas, fruit juices and flavoured milk. Globally, the corresponding figure is eight to nine per cent, according to management consulting firm, Technopak. But with the recent influx, the market could well soon expand, enabling Indian energy drinks consumption to catch up with that of the rest of the world. Red Bull, the world's largest energy drink company, still dominates the market, having entered 12 years ago, enjoying a 75 per cent share. But it is being increasingly challenged by the likes of Tzinga, Cloud 9, KamaSutra, Restless and Burn. More churn is expected as the second largest such company, Monster Beverage, is also on the verge of making an entry. Indeed in 2008, the Indian energy drinks retail market grew 51.5 per cent, says a report by global market research firm, Mintel. Industry consultant Frost & Sullivan has said the market is expected to keep expanding at a compound annual growth rate of 25 per cent between 2012 and 2015. 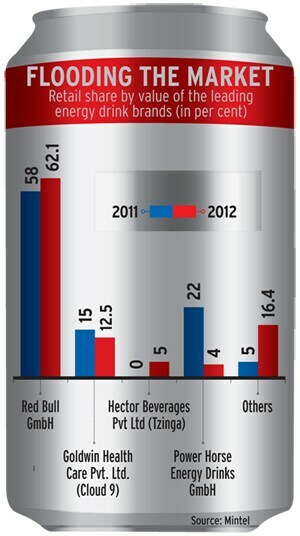 In comparison, the global energy drinks market, says Technopak, grew 14 to 15 per cent in 2011. "The more the merrier," says Ranju K. Mohan, Director & Business Head, J.K. Ansell Ltd, a joint venture between the Raymond Group and Ansell International, which manufactures several products under the KamaSutra brand, including the condoms. The energy drink was launched in December 2012. "What new competitors do is create a market, which is one of the biggest challenges." The growing interest in wellness, health and sports gives the newcomers further hope. "These categories are taking off and creating a nice platform for energy drinks to be accepted," says Ankur Bisen, Vice President, Retail at Technopak. "People's tastes are also changing. They are becoming more discerning and willing to experiment." But the newcomers also need to differentiate themselves from Red Bull to make any impact. How are they going about it? Pricing is the first focus. While a 250 ml Red Bull can costs Rs 95, Tzinga, created by Hector Beverages, has chosen the economy route, selling at Rs 25 a pack. "We have a clear proposition. Our drink has functional value, not an aspirational one. We sell at colleges, IT companies and BPOs," says Suhas Misra, Co-founder and Director, Hector Beverages. Muffaddel Janjira, Business Manager, Monster Energy Drink, at the Narang Group, which will distribute Monster's products, however, does not consider such price slashing a threat. "They have created that segment and done pretty well," he says, noting, however, that Monster's drinks would be clearly focused on the premium category, competing with Red Bull. Indeed Narang initially distributed Red Bull too, but parted ways with it last year. "Marketing, branding and positioning will have high impact on product acceptance," says Chaitra Narayan, Associate Director, Chemicals, Materials & Foods Practice, Frost & Sullivan. Thus, a number of the newcomers are trying to use these to set themselves apart. For instance, Nitin Gupta, Founder and CEO, K.G. Functional Beverages Pvt Ltd, which makes the energy drink Restless, is seeking an image of "restless action." "Red Bull and Monster primarily focus on sports events to sell," he says. "But we will appeal to people engaged in everyday activities." Again, the KamaSutra brand is banking on taste - its drinks come in different flavours such as mixed fruit and mixed berry fruit. The challenges, however, are many. For instance, despite their massive marketing machines, neither PepsiCo nor Coca-Cola has been able to make a success of its energy drink. PepsiCo's SoBe is no longer on shop shelves, while Coca-Cola's Burn has had to go in for a re-launch. "We have launched Burn and have been testing the waters for a while," says Venkatesh Kini, Deputy Business Unit President, Coca-Cola India and South West Asia. "We are happy with the results." Again, with so many jumping into the fray within a short period, a shake-up is almost inevitable. 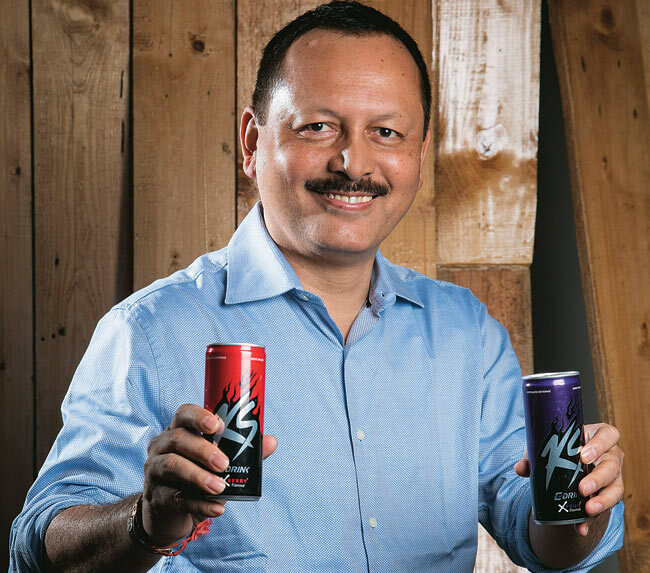 "In the coming two to three years, only one or two brands will establish themselves strongly," says Vinod Gaikwad, General Manager, Marketing and Sales, Greenways Food and Beverages Pvt Ltd, which makes energy drinks such as Cloud 9 and KS Energy. The energy drinks' primary markets are no doubt the metros and bigger cities, though Red Bull claims to be present in 300 towns across the country. Frost's Chaitra says over 70 per cent of retail sales are in restaurants, pubs and night clubs. But all these have to be handled with care. "We have seen brands in the past that had great brand propositions but failed to capture customers' imagination because of challenges in distribution. They could not guarantee availability at the right retail outlets," says Technopak's Bisen. So how does he expect the future to pan out? Overall, Bisen is hopeful. "Had you asked me 10 years back, I would have been a little skeptical about the size of the segment and who would buy these drinks," he says. "But now that energy drinks are positioned across platforms and it seems a sizeable sort of segment is forming."